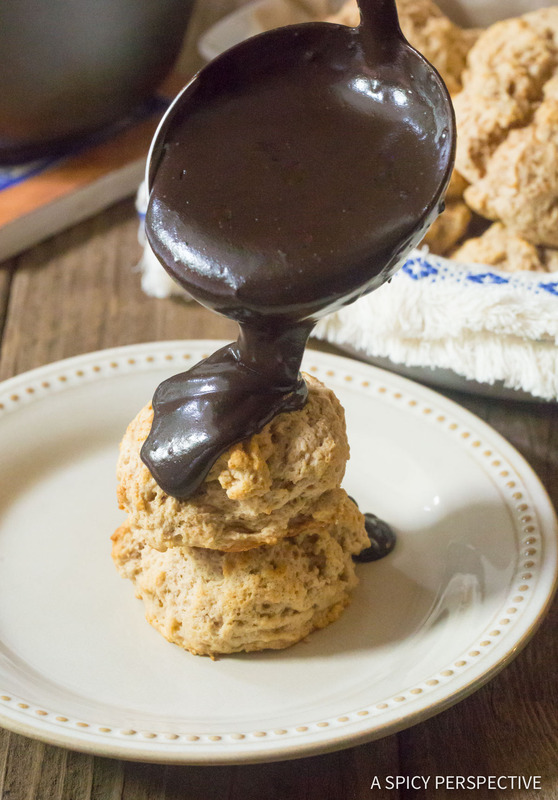 Dark Chocolate Gravy Recipe with Cinnamon Biscuits – This rich not-too-sweet southern chocolate gravy is the ultimate topping for buttery biscuits and scones! If you live north of the Mason-Dixon line, chocolate gravy might be a foreign concept to you. I used to ponder these things. Then I moved to the south and suddenly it all became quite clear. 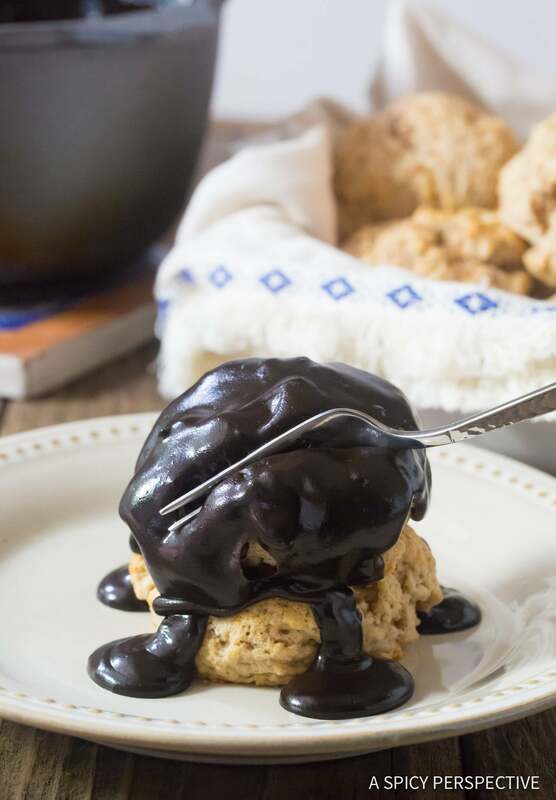 This thick, rich, shimmering sauce, with deep notes of chocolate sweetness, is the perfect complement to fluffy southern biscuits. The answer to this great WHY is found in the history of chocolate gravy. 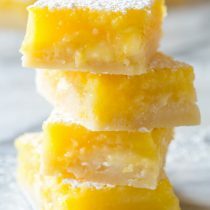 Although no one knows exactly who invented this alluring recipe, although many have tried to claim it, it’s believed it was born in southern Appalachia, specifically Tennessee. Along the Spanish trade route, in what was then Louisiana territory, merchants sold cocoa powder, showing local traders different ways to use it. Chocolate gravy was first known as Mexican Breakfast Chocolate, and has grown as a southern staple ever since. Chocolate gravy is considered a true Appalachian recipe. 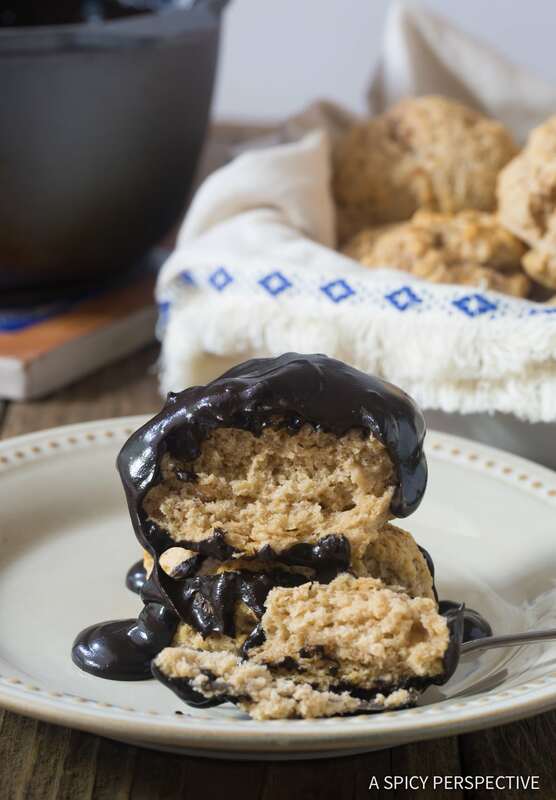 Making chocolate gravy is easier than you think! You might even have all the ingredients in your fridge and pantry right now. Butter – All good gravy recipes start with fat. Sugar – Chocolate gravy should be sweet, but not overly sweet. 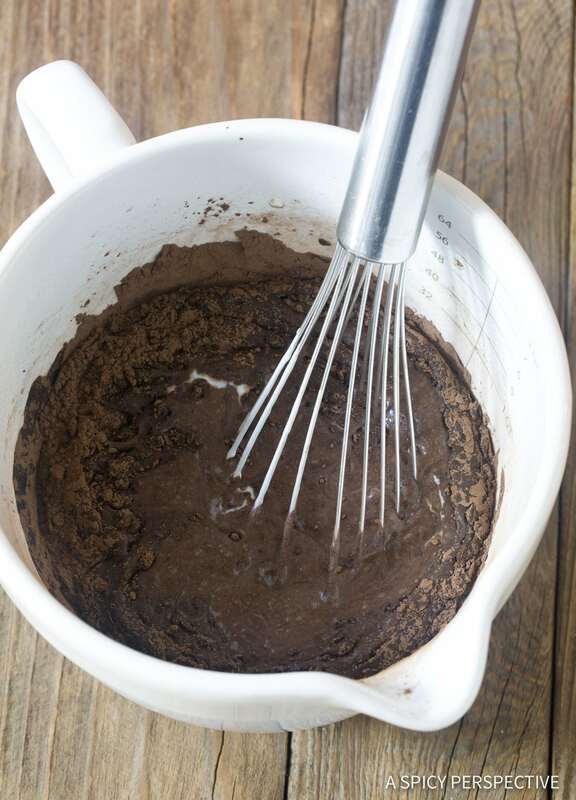 Dark unsweetened cocoa powder – You can use regular cocoa powder. However I find that dark cocoa balances the flavor better. It is also more likely the traditional choice from generations past. 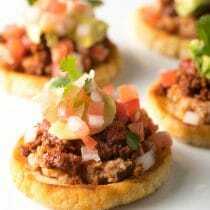 Ground cinnamon – Spanish (or Mexican) influenced recipes should have a little cinnamon, in my opinion. Salt – All sweet recipes need a little salt. Whole milk or buttermilk – Most current chocolate gravy recipes call for whole milk. However buttermilk was most likely the original choice. Settlers were always trying to make the most of their resources, and buttermilk was a great repurposed food. Plus, the twangy flavor of buttermilk work wonders with cocoa and sugar. Vanilla extract – Just because. Cinnamon biscuits – You need something to serve your southern chocolate gravy with, and biscuits are a perfect fluffy platform. 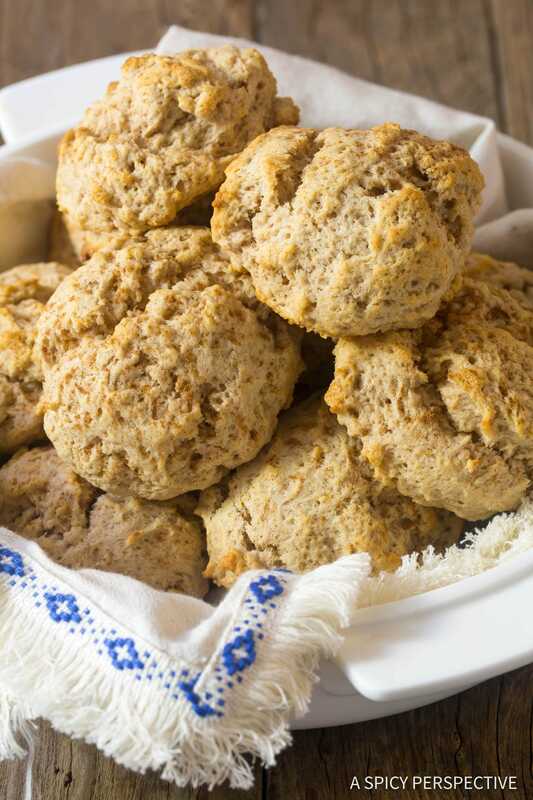 We love this recipe with Cinnamon Drop Biscuits! Gravy, by its most basic definition, is any sauce that starts with a roux… A cooked butter and flour mixture used for thickening. 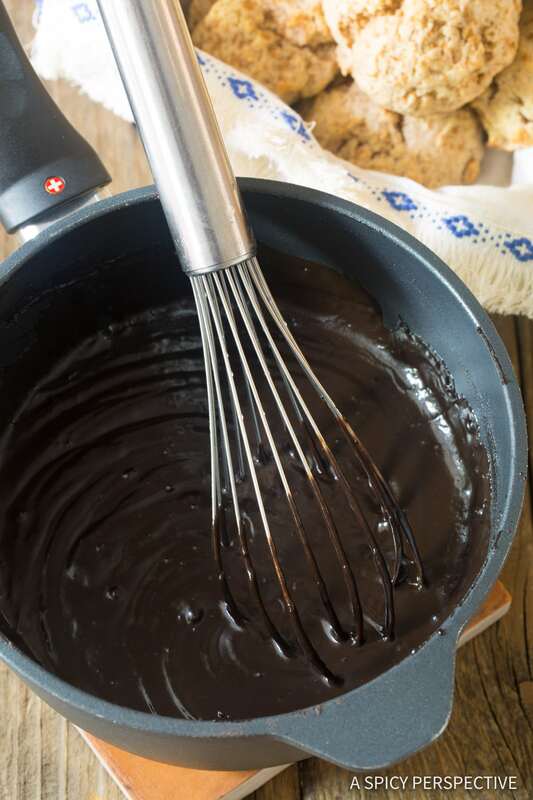 Although you can certainly start chocolate gravy by cooking butter and flour together, I find it’s easiest to combine all the ingredients like a cake batter, then to cook it to thicken. You do need to heat the chocolate gravy long enough so that the flour cooks and does not taste raw in the gravy. However, this only takes 5-10 minutes over medium heat. 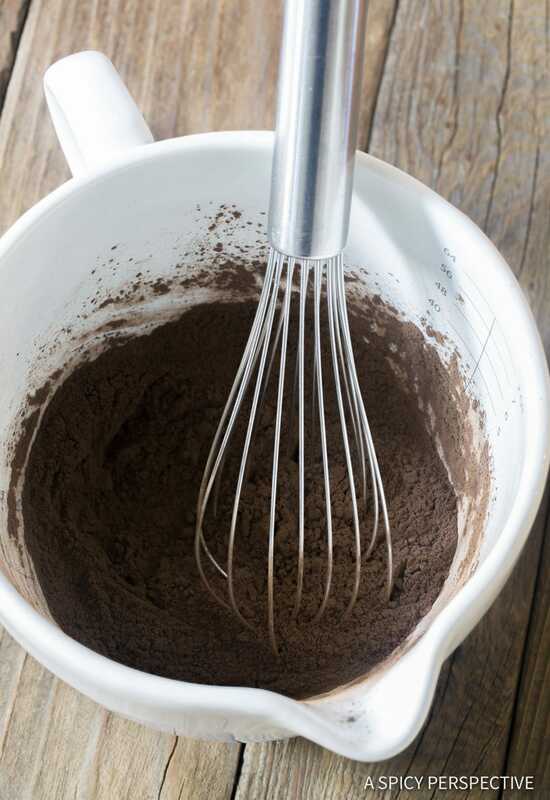 Whisk – Combine all the ingredients, minus the vanilla extract and whisk well so it’s smooth. 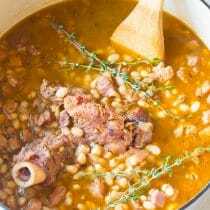 Heat – Simmer the gravy to thicken. Loosen – If the gravy gets too thick, add an extra splash of milk and a little vanilla extract at the end, to thin and flavor the gravy. Ladle – Now pour the hot gravy over warm biscuits and dive in while it’s still warm! 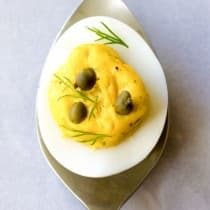 If you want to start your gravy with a roux, be sure to move the roux around the pan continuously so it does not burn. Then combine all remaining ingredients and whisk them into the roux. If you want your gravy to have a darker (more intense) flavor, reduce the sugar to 1/2 cup and add 1 tablespoon ground cinnamon. Chocolate gravy can be made ahead, and even frozen. Just make sure to whisk in additional milk when warming the gravy to loosen it up. 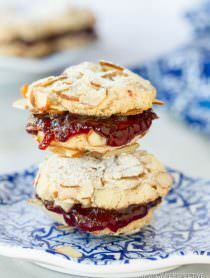 Don’t love biscuits? Try chocolate gravy over toast, french toast, or bread pudding. 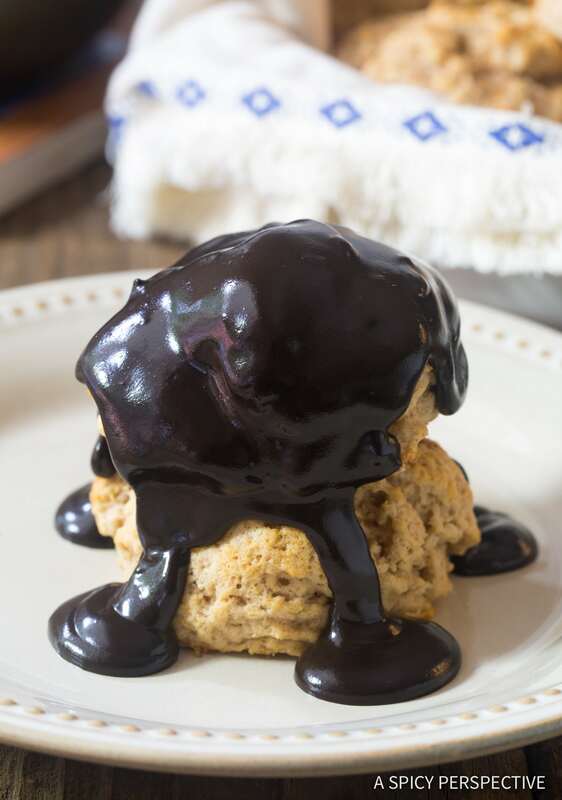 Dark Chocolate Gravy Recipe with Cinnamon Biscuits - This rich not-too-sweet southern chocolate gravy is fabulous over buttery biscuits and scones. In a mixing bowl, measure the sugar, cocoa powder, flour, cinnamon and salt. Whisk to combine. Add the milk and melted butter to the cocoa mixture and whisk until smooth. Then pour the mixture into a small sauce pot. Set the sauce pot over medium heat. Simmer the gravy to thicken, whisking periodically, for at least 5 minutes, but up to 10 minutes. This ensures the flour cooks through and does not taste raw. If the gravy gets too thick, add a splash of milk to thin it out a little. When ready to serve, whisk in vanilla extract. While it's still hot, spoon the gravy over warm cinnamon biscuits and serve. Someone in the Northwest once told me their grandmother always made them Chocolate Gravy. Don’t remember where they were originally from, but it just sounds Southern to me.I thought they were kidding, but they swore it was true. It sounded strangely yummy. Now I have a recipe! Thanks. My wife’s mother has always made choclate gravy on Christmas morning. We always asked where she got her recipe. She wold just say that her mother always made it for them. Now, as I read your post and story on the history of choclate gravy, we know, as Paul Harvey used to say, “now you know the rest of the story”. MamMaw was born and raised in Tennessee along the Spanish Trade route. In fact MamMaw met my wife’s father who worked for the railroad that now runs along that same trail. So, your history of choclate gravy, that we have wondered about for many, many years, provides us with “the rest of the story”. Thanks so much for your post. I love to cook and watched my mom cook as I grew up in the country and helping her can the vegetables we grew, unitl I got old enough to go work in the fields. When I went off to college, I got a job, where else would you think, in a restaurant. 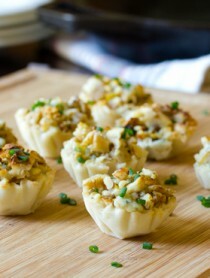 However, my cooking methods are true Southern style just like my mother’s and grandmother’s. By today’s standards, not too healthy, but good. For example, my gumbo is true gumbo. Roux started with bacon grease and flour in an cast iron frying pan, while the onions, celery and bell pepper saute in the pot with lots of garlic. Chicken stock and roux added with okra, crab claws, ham bits, with a little sliced sausage links for spice and flavor, shredded chicken cooking for about two hours then just prior to serving add the oysters, and steamed shrimp. Steaming the shrimp keeps them from getting mushy. Top off the finished product with “file” and you have got a great pot of gumbo. 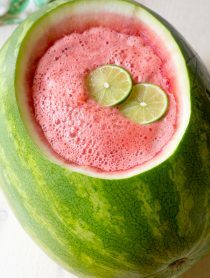 Could not make this in a reataurant, it is too expensive to make. I make this in a 20 quart pot and take it for football watching parties. Looking forward to another history lesson from you. I love this! Thanks for sharing your personal history. It’s so cool to learn they history behind our food, isn’t it?